The Delonghi Scultura ECZ351 is a sleek, traditional pump espresso machine that delivers excellent coffee along with eye-catching aesthetic appeal. It has a quaint 1950s retro look (available in white, black, champagne or grey), which can be matched by an optional toaster and kettle for people who want to outfit their entire kitchen with similar-looking equipment. As appealing as its appearance may be, the real question you’re probably asking is whether or not it can make good coffee; I am pleased to report that the De’Longhi does not disappoint when it comes to making high-quality, flavourful espresso. 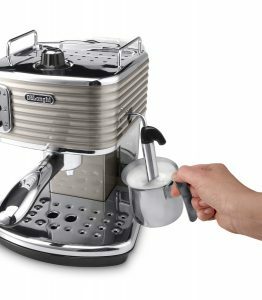 This Delonghi Scultura ECZ351 review will focus on the features and benefits of this impressive machine. With a generous 1.4 litre reservoir and a 2-in-1 filter holder, the De’Longhi Scultura ECZ351 simplifies the process of making coffee through intuitive design and easy handling. The reservoir is positioned on the back of the machine, making it easy to get to, so you can choose to fill it while it’s attached to the machine, or just simply grab the handle in the middle and pull it out to fill it directly from your kitchen faucet. The versatile crema filter is suitable for Easy Serving Espresso (ESE) pods as well as ground coffee, so you can go with whatever preparation style best fits your preference for the day. The Cappuccino System (with steamer wand) for the ECZ351 mixes milk, air and steam together in order to produce a creamy, rich froth for cappuccinos, lattes, macchiatos, or whatever other milk-infused coffee drink may tickle your fancy on a given day. The ECZ351 includes a practical cup warming plate, as well as an EcoFunction auto-shutoff feature that automatically shuts the coffee maker off after 20 minutes for optimal energy consumption. With 1,100 watts and 230 volts of power along with 15 bars of pressure, the ECZ351 is fully equipped to produce professional cafe equipment results from home, allowing you to be the barista in full control of your own coffee concoctions. User-friendliness is definitely one of the strong points of the ECZ351. First of all, it features a self-priming system that enables the machine to basically be ready for use at all times. Fortunately, thanks to the adept design team at De’Longhi, the water reservoir is easy to get to, and it’s also transparent, so there won’t be any mystery as to how much water you might be working with when you’re preparing to make coffee. The easy-to-understand control panel gives you simple options to choose from; you have an “on” button, a button to adjust steam temperature, a button to turn on steam or hot water (depending upon the current setting), and a button for dispensing water. Thankfully, this simple interface is a world apart from some of the other more “sophisticated” coffee makers out there that have control panels similar to an airplane cockpit. Each button also features an accompanying green indicator light to let you know whether or not the machine is hot enough to produce steam or dispense water. As you’re waiting for the machine to warm up (which doesn’t take long), you can use the warmer on top of the machine to pre-heat your cups, so that you won’t be pouring coffee into a cold container. Operating the machine is a piece of cake. The first thing you will need to do is choose the particular filter you want to use in the group handle. You can use a single-shot filter, a double-shot (i.e. two cup) filter, or one for the ESE pods. I’m partial to using fresh-ground coffee, but the functionality is just as efficient when you’re using pods. Just remember to keep your coffee grounds lightly compacted, and then level them off; there’s no need to put undue pressure on the grounds or try to cram them in as much as possible. Using the steam wand is also a hassle-free operation; when the machine is up to the appropriate temperature, you can use the tap on top in order to control the flow of milk, producing a velvety foam that makes for one heck of a latte. If you’re ever in the mood for a good old-fashioned hot chocolate, you can use the steam wand to produce hot water by pressing the “dispense water” button and then delivering the water through the tap. As far as cleaning goes, it’s a fairly easy operation; simply slide out the drip tray and empty it. Everything that makes the De’Longhi Scultura ECZ351 what it is has been built into the unit, so there aren’t any additional accessories that come with the machine. As mentioned earlier, De’Longhi does offer the option for you to purchase a matching toaster and kettle, but those items are not automatically included in the package. Makes great coffee, espressos and milk-based drinks – and that’s what’s really important! It may take you a little while to figure out how to get your froth where you want it with this machine, so factor in a little bit of a learning curve as you’re developing your cappuccino skills. Once you get it how you want it, you will definitely see how well the consistency of the froth holds. In addition, if you’re concerned about noise level, you’ll be happy to know that the De’Longhi Scultura ECZ351 operates with minimal noise. In other words, you won’t have to worry about waking up the entire household just to make your morning cup of joe! You can read some of customers’ reviews here. Magazine Which? verdict on this product was “one of the best: 86%”. The De’Longhi Scultura ECZ351 delivers on all of the important points that you would look for in a coffee machine – it looks great, it’s easy to control and it delivers superb coffee every time. While everyone has their own opinion of what the best machine is on the market, I would say without hesitation that for robust, reliable and solid performance, you can’t go wrong with choosing the Delonghi Scultura ECZ351. Delonghi Scultura ECZ351 Coffee Machine is a traditional pump espresso machine that delivers great espressos, milk frothing, has beautiful design and is easy to use and clean.